If you take the course, you’ll learn why it makes sense to work that way (short answer - you’ll increase your selling potential across all markets), and how to do it effectively - in a way that takes into account your unique taste, and helps solidify your style. Make sure you’ve signed up for my newsletter because I’ll be announcing dates very soon! In the meantime, here’s a story about the biggest DON’T when it comes to collections - and you may well have done it (like I did - even after years of experience). Which made me stop and think. Because it was a coordinate based on these four placements. Can you see what I saw? I didn’t protest. I didn’t want to stall the momentum and lose my jackpot sale.But by selling the coordinate I made the entire rest of the collection redundant. If you can’t see why, I’ll explain. When, working in collections, every single new piece of art must have new, original key motifs. You can’t sell them twice. Your client doesn’t want to see his original, purchased art on a competitor’s products. And if you’re licensing (rather than selling outright as I did ), you can’t relicense the same images to the same product category twice - for the same reason. Either way, it doesn’t pay to repeat your key imagery across designs. You may well ask why I even did the coordinate, after years of working as an artist and knowing full well that you can’t repeat motifs. I don’t know. I just thought they looked cute together, and it was so easy to pull them over in Illustrator into a new file. It was tempting and I wasn’t thinking about the risks. Ever had a similar lapse in judgement? 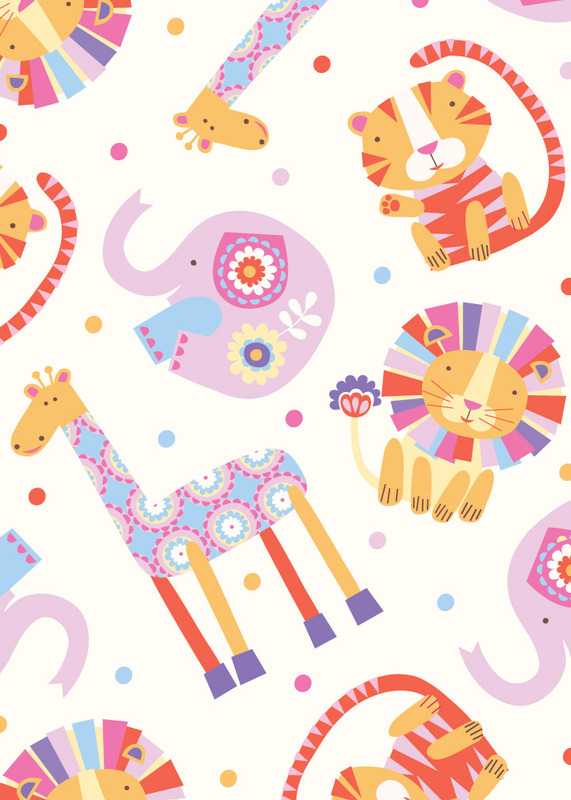 So now my baby jungle animals are languishing in Dropbox forever more. And the moral of the story is…don’t do THAT! Create new key motifs for EVERY design. Talking of collections, are you following my INSTAGRAM CHALLENGE. I’m running it in conjunction with #the100dayproject which started today. The idea is to create an unpolished, experimental sketch of either a bird, butterfly or flower, every day for a hundred days. Have you signed up for my FREE STEP BY STEP GUIDE TO GETTING YOUR ARTWORK IN FRONT OF CLIENTS. Hundreds of artists have and here’s just some of the feedback. Sign up for your FREE STEP BY STEP GUIDE TO GETTING YOUR ARTWORK IN FRONT OF CLIENTS here! Share the link below with your fellow artists! AM I READY TO SEND OUT MY ARTWORK TO CLIENTS? Recently, I offered a FREE STEP BY STEP GUIDE TO GETTING YOUR ARTWORK IN FRONT OF CLIENTS, in which I laid out a strategy for assembling a client list and sending your work out. You can get yours here. However, you may be wondering whether you’re actually ready for that step. To help you decide, I wrote this blog post (then promptly got sick, so sorry for the delay!). If you’re venturing into the world of commercial art, you’re working towards a particular goal - to get your work seen by the people that count - the ones who will pay you for what you’re doing and turn your passion into a living. Perhaps you’ve created print on demand products and are thrilled with the results (that cushion looks stunning on your sofa and everyone you know wants one! ), maybe you’ve won challenges and competitions and got some well-deserved recognition, or you’re already working with clients but feel you should be reaching more of them. On a good day, you feel you’ve got what it takes and you’re imagining your designs on cards, wall art, and dinnerware in your favourite stores. On a bad day you’re filled with anxiety and self doubt and think you just need a bit more time. The worst days find you on Instagram looking at everyone else’s work and thinking it’s hopeless. At the root of this emotional pendulum is the fear of being rejected. We all experience the cycle - I’m great, I’m rubbish, give up, soldier on. It’s very tiring and you know you’re supposed to combat the fear by just going for it. But are you actually ready? Truthfully, there are a few basic criteria you should aim to meet before taking the leap - and some important questions to ask yourself. DO I HAVE ENOUGH WORK? Is there a magic number?? What’s the exact number of designs that’s acceptable?? You’d love to know the answer to this - but there isn’t one. You just need enough to make an impact. Some people will make an impact with fifteen super cohesive, brilliantly conceived pieces that convey a rock solid style. Others will make an impact with sixty pieces that cover every commercial theme in the book - from Halloween to Hannukah. You might have twenty painted floral placements, or fifty vector patterns of dinosaurs and trucks, or vice versa. The main thing to consider is whether the designs are strong, consistent and cohesive. IS MY PORTFOLIO COHESIVE? WHAT’S MY STYLE? We’re all on a quest for style. But the quest can be made less daunting by thinking in terms of creating cohesiveness and consistency, instead of ‘finding’ your style. One is you taking control, making something happen, the other is something happening to you - as you inadvertently stumble upon it! This is a huge topic for a tiny section of a blog post but start by asking yourself this - when you look at your work as a whole, does it look like the work of one person, or five people? If it looks scattered and disjointed you probably should tighten it up before sending it out. Your work can hang together by a number of common themes, including subject matter, technique, and colour. I’m going to go into this in far greater detail in my upcoming course, Create Collections - but for now, here’s a tip. The hands down, quickest fix for a disjointed portfolio is the application of a unified colour theme. It can be a massive spectrum of colours or a limited selection of just a few - but whatever the palette is, it needs to be consistent. This will instantly help your work look tighter and make a greater impact. Have a look at my designs on the cards by Pigment below (currently sold in Paperchase, UK). Each piece came from a different collection. They were already unified by a common style but I adjusted the colours to make them super cohesive. See how impactful a tight palette can be! DO I HAVE A BASIC ONLINE PRESENCE? Speaking of making an impact - your chances of doing that are very much diminished if you don’t have a basic online presence. You need a clean, organised website, where your art is the star of the show (Squarespace is great), and an Instagram account. These two things are the fundamentals of looking professional. You can base your entire career on only these but they are inescapably important. Art directors do look at Instagram and a strong feed (not necessarily with a huge following but with a consistent, carefully planned input) shows that you are serious. Since Facebook and Instagram are so interconnected and you can shoot Instagram posts to Facebook, why not have a Facebook page too? I have great engagement on my Facebook page even though I have one tenth of my Instagram following on there! With a body of cohesive work, displayed clearly on a clean website and a well curated Instagram page, you can feel confident about sending your work out, knowing that you look professional and serious about selling your work. Hundreds of artists have signed up for my FREE STEP BY STEP GUIDE TO GETTING YOUR ARTWORK IN FRONT OF CLIENTS. Here’s just some of the feedback.